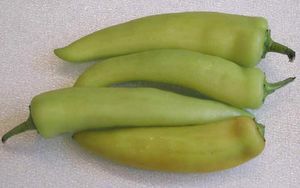 Early and productive variety bearing 5.5" long by 1.25" wide fruit with medium-thick walls that is bright yellow turning to red. Pepper pungency is about 10 times greater after drying. Also, peppers grown under stress and/or high heat and humidity will also be hotter than hot peppers grown under moderate climatic conditions.